The new edition of the ISWAN Seafarer Centre Directory has been printed and is now being distributed to nearly 400 seafarer centres around the world. Thanks to a generous grant from the ITF Seafarers' Trust, ISWAN has been able to update the directory in hardcopy and online here, with an added geo-map of centre locations that will make it easier for the seafarer to find the centre. The directory is also available as a downloadable pdf at the foot of this page. The directory includes 429 bona-fide seafarer centres, all operating for the welfare of seafarers. It lists available facilities, contact details and opening hours, and it continues to be extremely valuable to seafarers looking for their nearest centre. Many centres are able to offer free or cheap Wi-Fi, refreshments, recreational facilities and friendly supportive staff; all of which can be a great comfort to seafarers who have been at sea for long periods of time. A total of 60,000 copies of the directory are being printed and distributed to centres, welfare workers and a number of ships with the help of Wrist Ship Supply. The directories have been printed in the UK, India, and the Philippines. 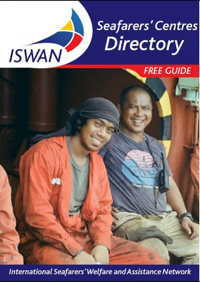 We estimate that over 250,000 seafarers will be able to make use of the new directory.